Calculate Lewis And Clark Bridge Tolls. The Lewis And Clark Bridge connects Louisville, Kentucky, over the Ohio River, with Jeffersonville, Indiana. While the bridge span is, itself, only approximately 2100 feet long, the approaches from each side of the bridge make the total drive distance, from any entry to exit point, more than five miles. While the roadway is labeled as KY 841, it is also I-265 in Kentucky and State Route 265 in Indiana. ► Starting exit and Mile Marker: Gene Snyder Fwy at I-71 / Louisville, KY at Mile Marker 34.7, in Louisville. ► Ending exit and Mile Marker: Old Salem Road / Watson, IN at Mile Marker 11.6, in Jeffersonville. 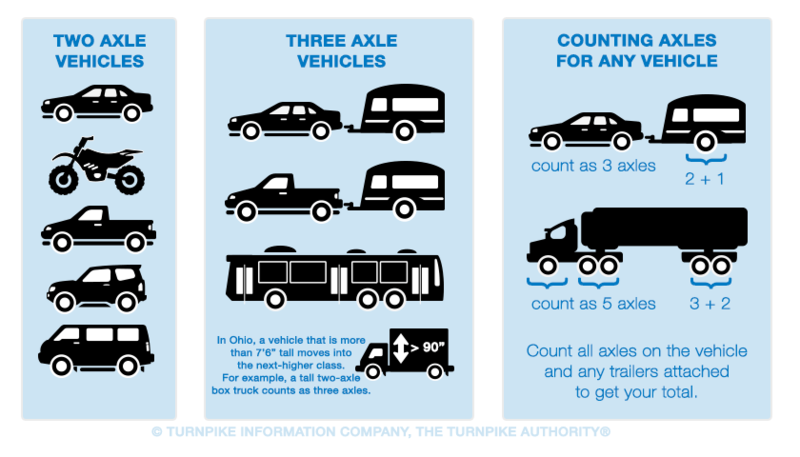 Tolls on the Lewis And Clark Bridge are calculated based on the number of axles for your vehicle. When counting axles, make certain to count the axles with wheels on the ground, including any axles on trailers you may be towing. There are 5 axle designations for Kentucky. ► 2-axle cars, vans or trucks under 7'6"
► 2-axle vans or trucks over 7'6"